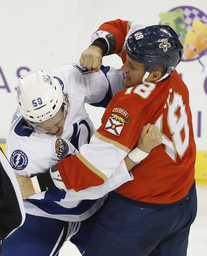 The Florida Panthers started weak, then had a strong finishing kick. After allowing two goals in the first five minutes of the game, the Panthers scored three times in a span of 2:28 in the third period and then held on for a 5-4 victory over the Tampa Bay Lightning on Saturday night. Jared McCann scored the tiebreaking goal after a review overturned the initial ruling of goalie interference. Evgenii Dadonov and Nick Bjugstad each had a goal and an assist, and Vincent Trocheck and Colton Sceviour also scored goals for the Panthers. James Reimer made 26 saves. The Panthers tied the score 3-all on Sceviour's goal at 6:06 of the third. Moments later, McCann's shot went over the shoulder of Andrei Vasilevskiy and into the net at 6:42. The goal was initially waved off due to goalie interference by Florida's Connor Brickley. Upon review, it was clear Brickley was not in the crease, the ruling was overturned, and the goal was good. "I know (Brickley) didn't interfere at all with him," McCann said. "I kind of said a prayer there real quick, and it was answered." Panthers coach Bob Boughner, who was hired on June 12, recorded his first NHL win after losing the season opener 5-3 Friday night. "It was a big character win, especially after being a little deflated from last night," Boughner said. "Our message today was there's no moral victories; come back to work. I think we did that." Nikita Kucherov, Vladislav Namestnikov, Brayden Point and Tyler Johnson scored goals for the Lightning. Vasilevskiy stopped 43 shots. Steven Stamkos had two assists. Trocheck stretched the Panthers' lead to 5-3 when he poked in a rebound at 8:34. Tampa Bay closed to 5-4 when Johnson swept in a loose puck from in front with 5:48 left in the third, but the Panthers were able to kill off two power plays in the final 4:06. "The right team won . that's it," Lightning coach Jon Cooper said. Point gave the Lightning a 3-2 lead with 6:03 left in the second. His was blocked by Reimer but the puck bounced off Reimer's body and drifted behind him into the corner of the net. It was just the second shot of the period by Tampa Bay, which was outshot 36-10 at that point. "We didn't deserve to win tonight," Stamkos said. "We've given up eight goals in two games. Not a recipe for success." The Panthers tied the score at 2 on Bjugstad's goal 1:46 into the second. Trailing 2-0, the Panthers closed to 2-1 on a power-play goal by Dadanov, who buried a rebound from the slot with 7:42 left in the first. The Lightning took a 1-0 lead 3 1/2 minutes into the game. A shot by Stamkos hit off the crossbar and Kucherov poked in the rebound. Namestnikov put the Panthers ahead 2-0 with his power-play goal at 4:48. Notes: Lightning right winger J.T. Brown raised his first during the playing of the national anthem. Brown remained standing through the anthem. "I wanted to do something to show my support. There's some issues that we have to talk about," Brown said. "I know there's going to be negative backlash, but in my heart I know I did what was right. ".The Lightning played the second half of a back-to-back set, the first of 12 back-to-backs this season. . Kucherov has scored six goals in his last eight games against Florida. . Panthers center Jonathan Huberdeau notched his 200th career point with an assist on Dadanov's goal.